Donor health care distinguishes itself from other medical specialties in a number of ways. These aspects, particularly in relation to each other, define the unique character of the domain of donor health care. Firstly, donor health care deals with healthy donors. Its aim is to objectively evaluate the suitability of the donor, who in principle is a healthy volunteer. The intervention the donor wishes to and must undergo is in no way related to his own health. This is essentially different from the treatment of patients, where there is an indication for treatment or a medical intervention, and abstaining from this would lead to harm. For post-mortem donors too, the cause of death is independent of the ‘treatment’ the donor will or shall undergo. Secondly, the recipient’s perspective in the evaluation of the donor and donation is of utmost importance. The practice of donor health care is naturally framed by the interest of the patient undergoing treatment with a Substances of Human Origin (the recipient). The interests of the patient are the domain of the treating physician, who determines the indication for use of foreign bodily material. Not only the need for donors (quantity and nature of the need), but also the quality and safety of the donated material are defined by the requirements applicable to an adequate treatment of the patient. Donor health care moves between public and patient care, and attempts to translate between them. Furthermore, the ‘treatment’ that donors must undergo – in the form of interventions and examinations – are generally in the interest of the patient who shall receive the bodily material, with the exception of a few investigations that are performed to determine the health status for the donor’s own protection. 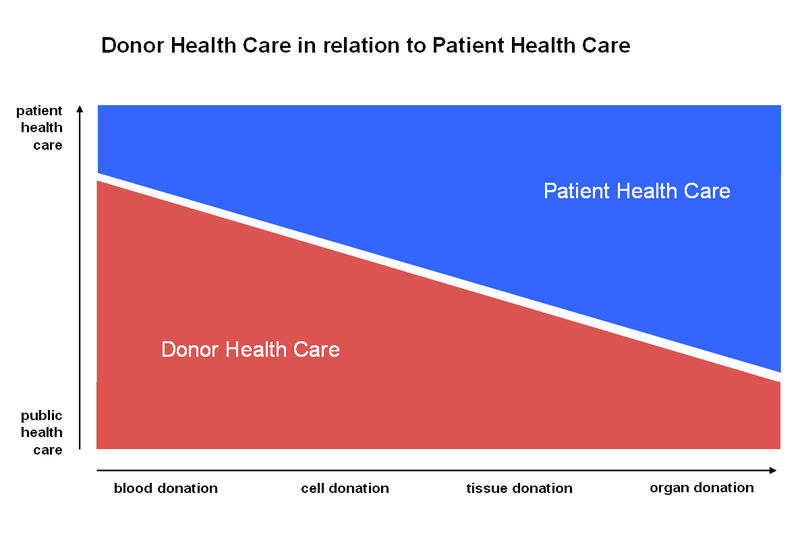 The distinction between donor health care and patient health care is depicted in the figure below. The role of the donor professional depends on the context of the donation. Blood donation is mostly a public care activity. On the left side of the figure, donor professionals are involved in selection, donation and care for complications. Only to a minor extent, e.g. very rare blood groups or serious donor events, professionals from the patient health care domain are involved. In contrast to blood donor care, organ donation on the right side of the figure is largely the field of physicians such as nefrologist and surgeons. In this area the role of the donor professional is small and contributes to general aspects, guidelines and consultancy. Cell and tissues donation are between the extremes of blood and organ donation.